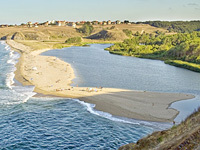 There’s no doubt Sinemorets is the heavenly spot on the Bulgarian Black Sea coast. The green slopes of the Strandzha mountains, the silvery unspoilt beaches, the crystal-water bays offer the most idyllic setting to unwind from stress and strain of the busy city life. The remoteness from city bustle and unique scenery ensure a relaxing and unforgettable stay. The southernmost beaches of Bulgaria are here. Sinemorets is situated on a peninsula 6 km to the south of the holiday resort Ahtopol and 90 km to the southeast of the city of Bourgas. The old names of the village are Galadzaki and Kalandzha. In 1934 it was renamed to Sinemorets. The access to the village was greatly limited in the past due to its closeness to the Bulgarian-Turkish border. In 1990 this restriction was lifted and tourists can freely visit it nowadays. Sinemorets is provided with electric network, water supply and sewerage system as well as a water purification plant. The telephone services are all digital and there is also cable TV here. It can accommodate over 1000 tourists in hotels, private lodgings and holidays homes. The local church with patron saint St. George is situated in the westerly part of the village where the center of the old Greek hamlet used to be once. The church has been restored through private funds and donations and is open to visitors today. Particular interest here might present the icon of St. Modest, patron saint of farmers and shepherds.